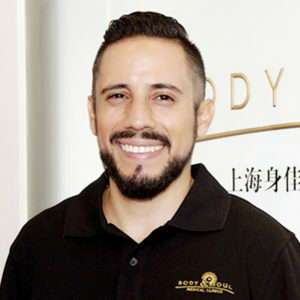 Originally from Colombia, where he became a lawyer by profession and as of 2009, a Reiki Therapist by passion, Gabriel has worked with two Reiki Masters who taught him the confidence and wisdom to skillfully learn this technique. Upon completion of his training, he started his practice in Colombia, which he pursued in China. His practice includes Reiki healing, energy cleansing, chakra harmonization, rebirth and empowering rituals amongst others. Mastering Lama Fera and sound healing, Gabriel provides a whole set of tools of awareness and advice to others. He believes alternative healing is the path to find inner peace. He helps his patients to grow and learn and leads them towards the path of healing.